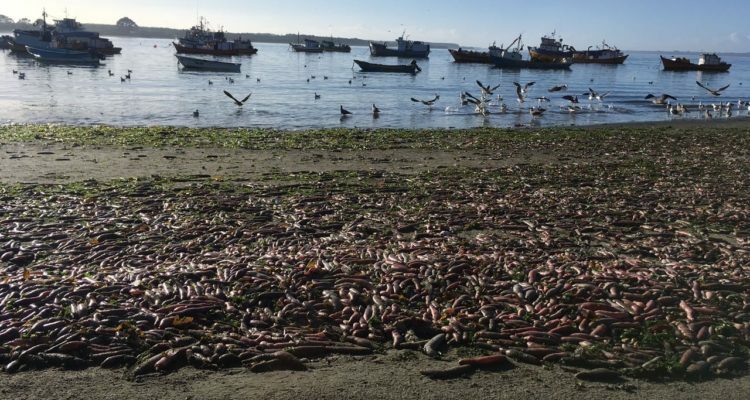 Tons of sea worms or pinucas beached on the beach of Carelmapu, Los Lagos region, Chile. The harmful algae bloom Karenia is thought to have caused the deaths. The phenomenon occurs on the coast near the facilities of the port and the urban area, where tons of these species remain dead and in a state of putrefaction causing a terrible smell. The inhabitants are asking for the intervention of the local government in order to remove the problem. One of the solutions could be to bury this waste, however, neighbours say that with the rotation of tides every time the sea expels more specimens towards the beach.